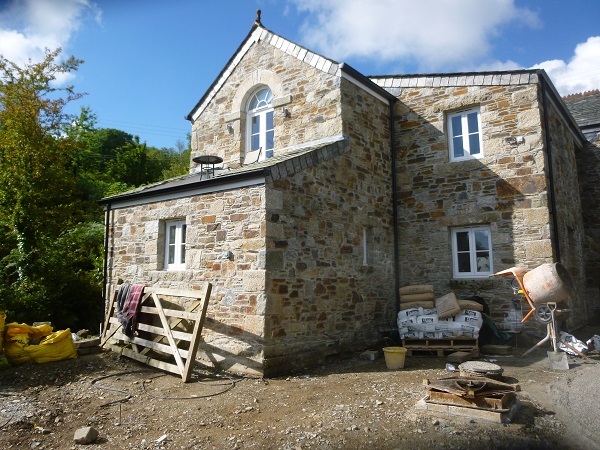 Over the years, at Streamside, we have carried out a great deal of work converting, repairing and restoring this old barn which dates back to sometime during the early 1800’s. 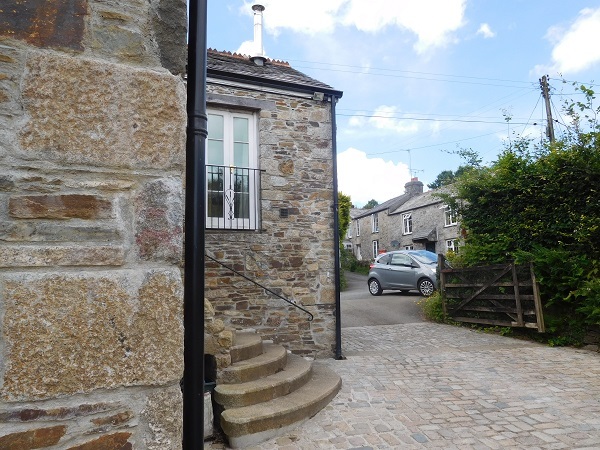 First of all we converted the original small barn into a holiday let. 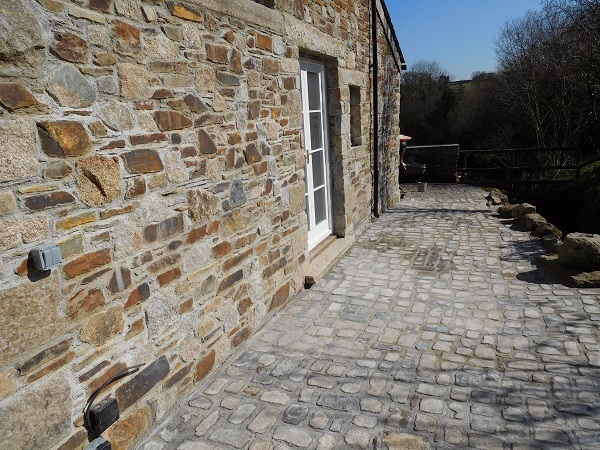 Then, a few years later, we carried out all the stonework to a timber framed extension which was added on. 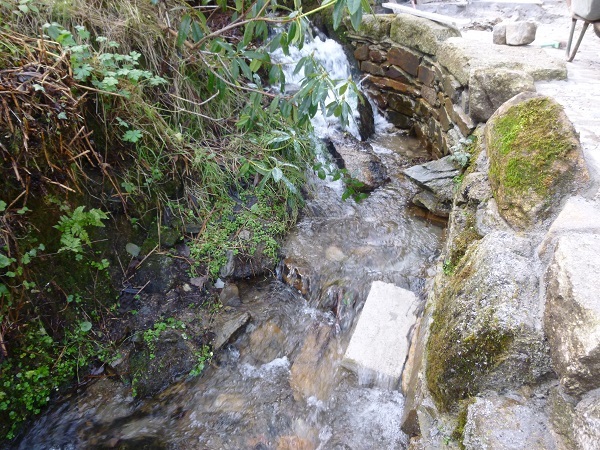 Also during heavy rainfall when the stream, which runs alongside this property, bursts its banks, we repaired that too using Gabion baskets. 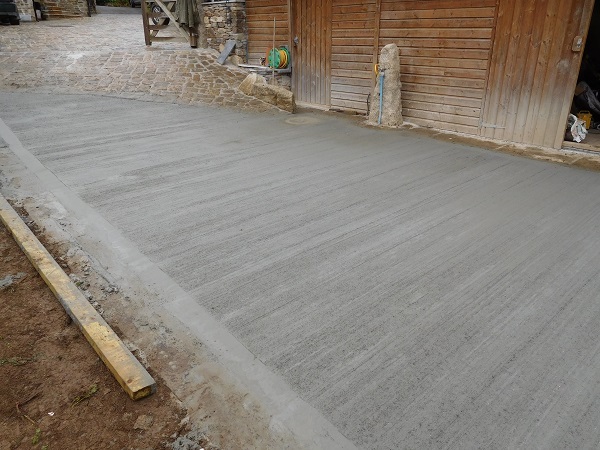 On completion of the new timber framed extension, the final task was to finish off the driveway and external ground finishes. 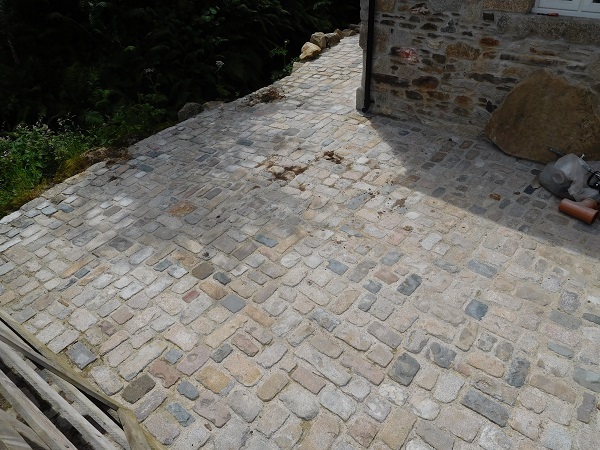 This was done using reclaimed granite setts and was to go all around the outside of the new extension. 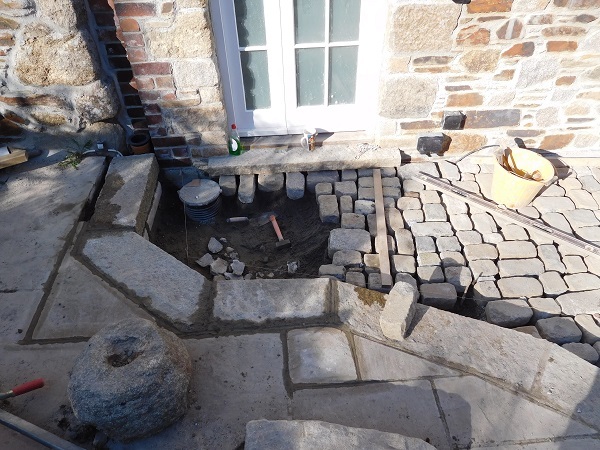 Once the ground levels had been reduced and compacted, our first task was to construct a small stonewall at the bottom of the driveway. 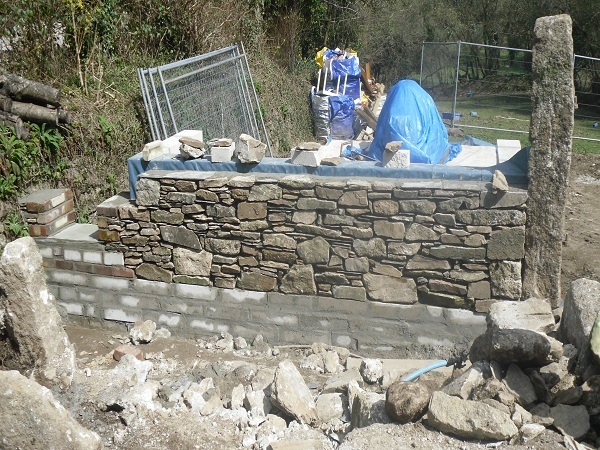 This wall was built from an old granite post we had set in to form one side of the field entrance across to the original boundary. It would also form part of the gable end to a new timber building which was going to be a workshop. 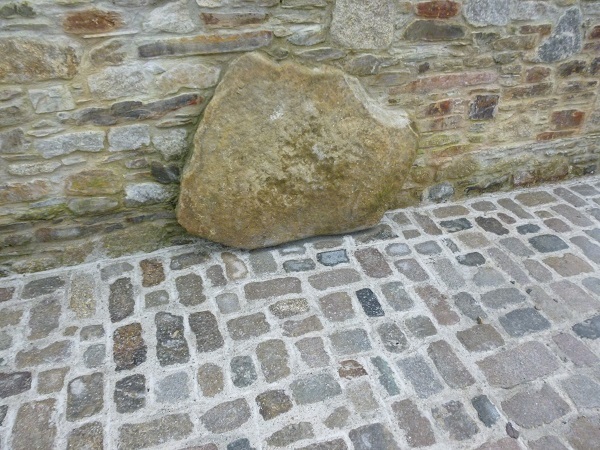 The wall was built using reclaimed stone on site consisting of a mixture of slate and granite. 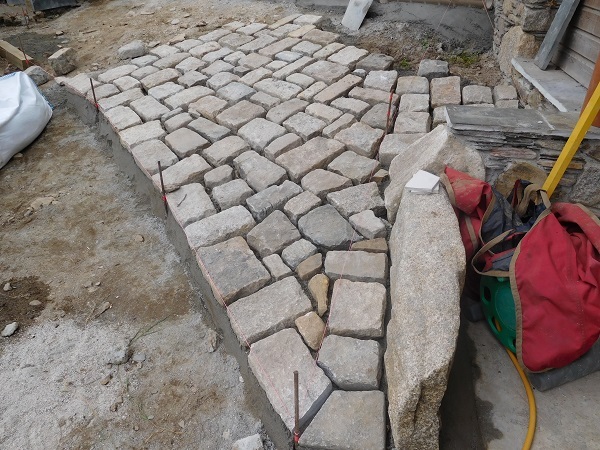 Across the entrance between the two granite field posts, we laid down reclaimed granite kerbs on a concrete bed to form an edge for us lay the granite setts against. 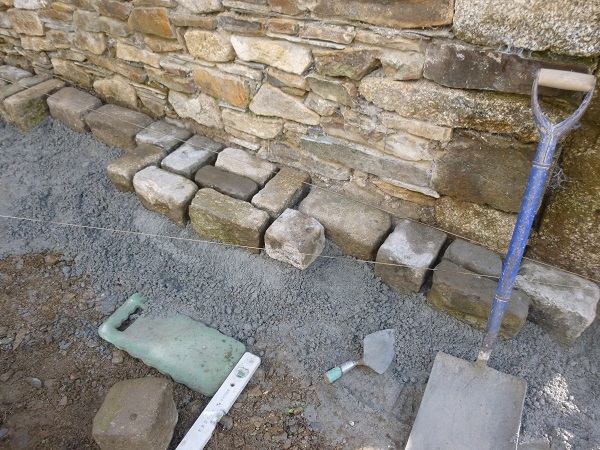 We then started to lay the granite setts along the edge of the new wall we had built previously. Steel pins were driven into the ground and guide lines attached to give us our falls. 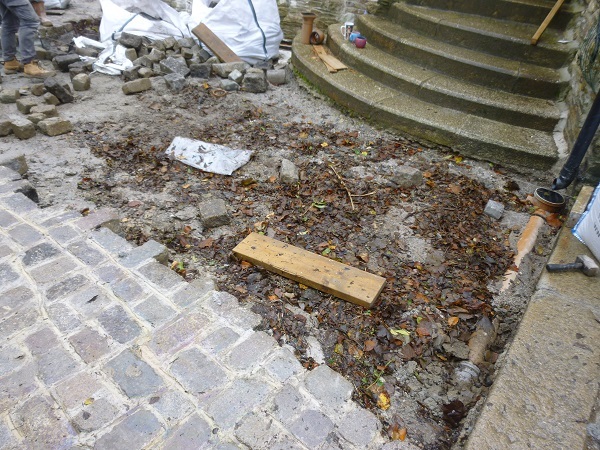 The setts were laid on a continuous sand and cement screed. 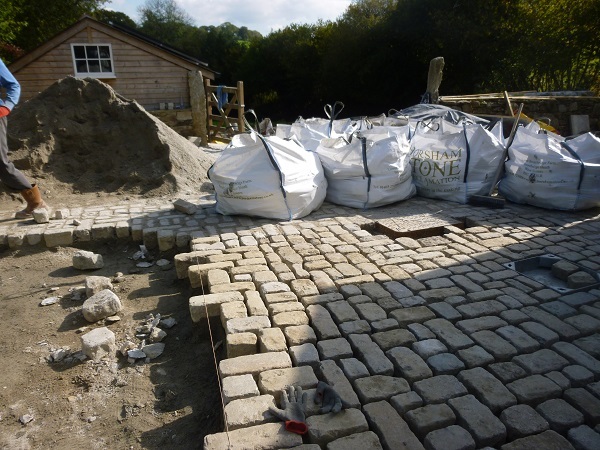 We had a large pile of setts for us to choose from and this was our first delivery of many. 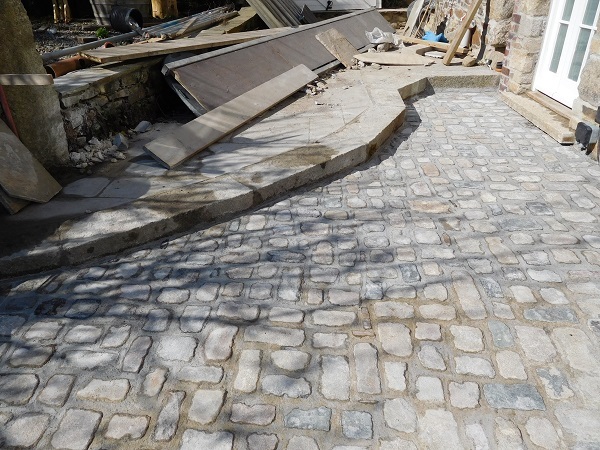 The problem we had was that this project required a huge quantity of setts and trying to source that amount of reclaimed setts of all the same size and colour was impossible. 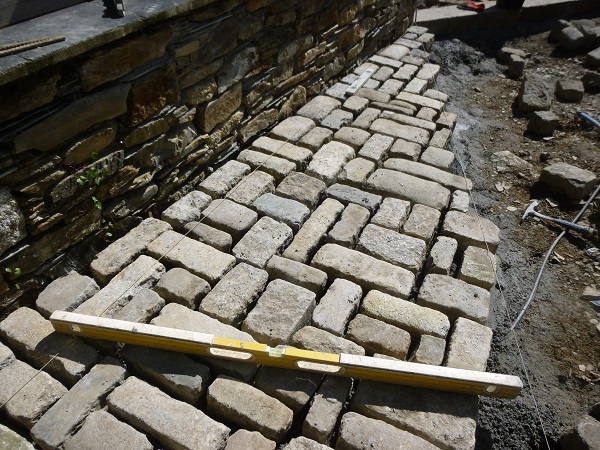 The client had no choice but to buy whatever setts were available from various sources. 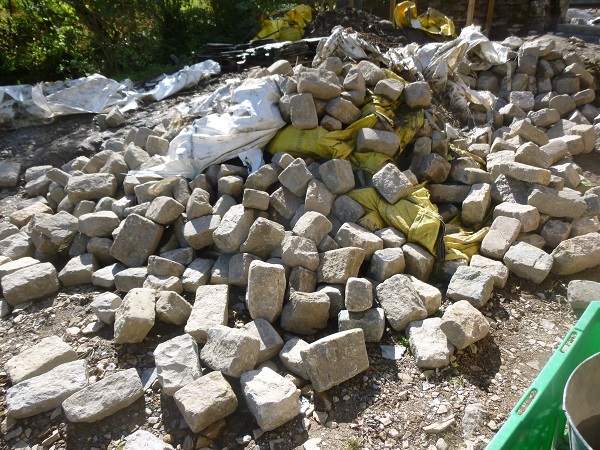 This meant we had a pile of granite consisting of all shapes and colours. 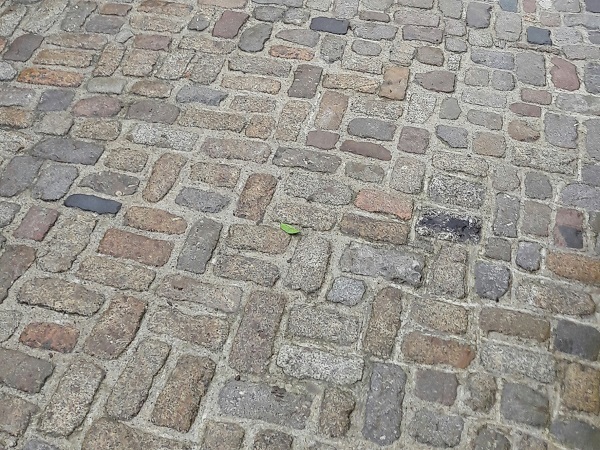 Because of this it was agreed we would lay the setts in a completely random pattern instead of the traditional rows that you so often see on cobbled streets and back lanes. The driveway was quite steep so we started at the bottom and worked our way to the top. 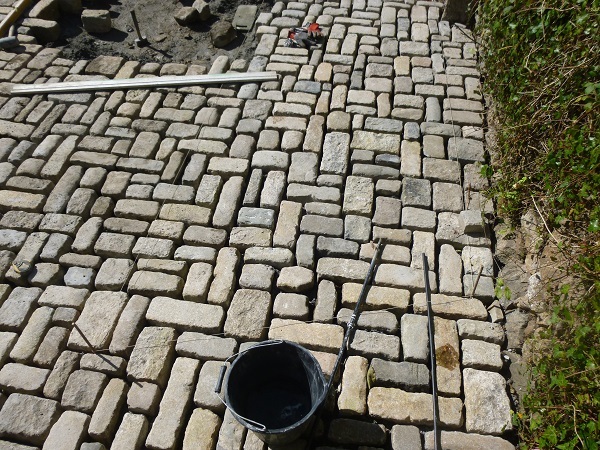 We laid the setts in bays with setts protruding out to tie into the next bay and not give any straight lines in the joints. 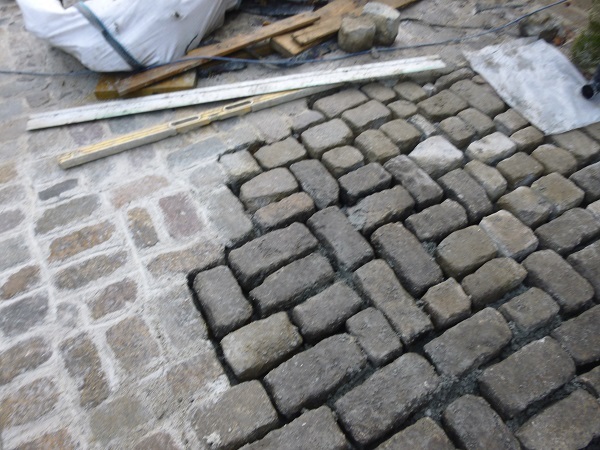 Although the setts were laid on a sand and cement screed, the jointing was carried out using NHL5, a natural hydraulic lime along with coarse silver sand. 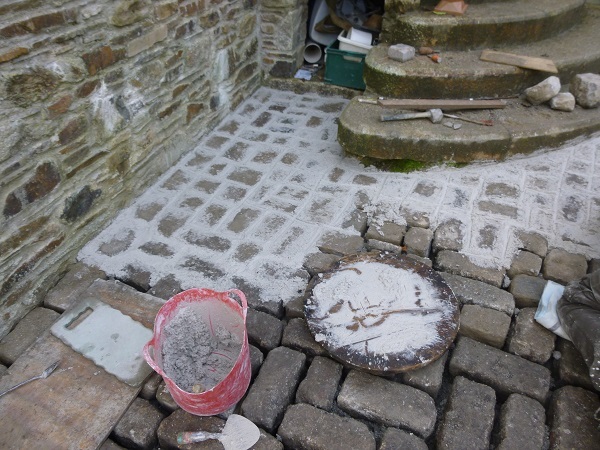 The lime pointing mix is packed into the joints fairly wet. 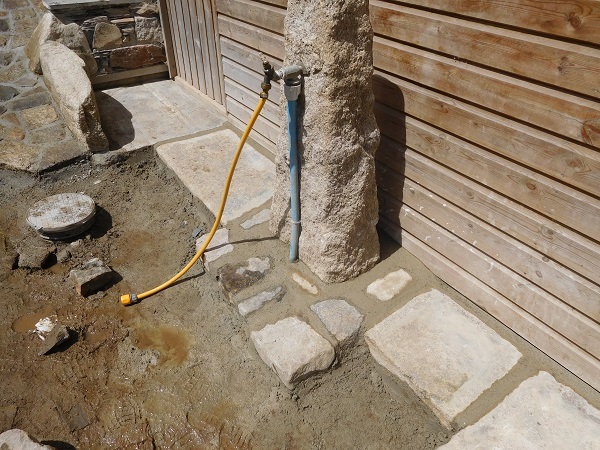 It doesn’t really matter at this stage if the mortar stains the granite so long as the joints are flush and full. 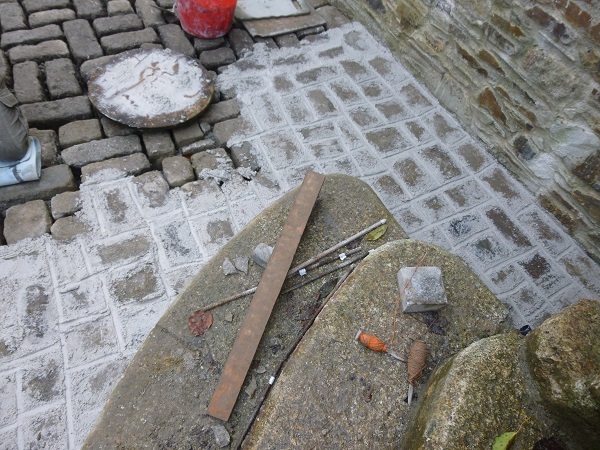 After a couple of hours has passed the joints are tooled in with a ‘tuck pointer’ which is a long thin narrow tool. The width of these tools vary from about 25mm down to 6mm, depending on the size of joint to be finished. 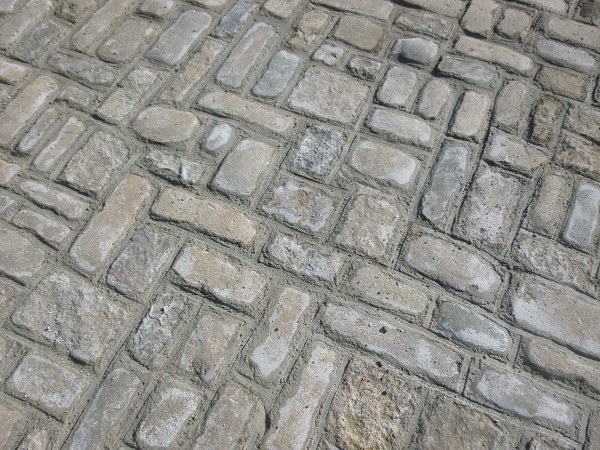 The jointing is left slightly recessed to show the edge of each stone and then left over night to set. 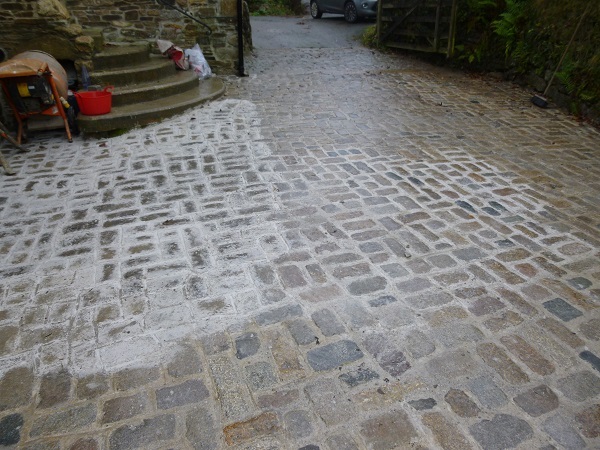 The next day after the jointing has had time to set, they are given a good hose down with clean water and a light scrub with a stiff brush to clean off any excess staining from the lime mortar and to expose the aggregate within the jointing itself. 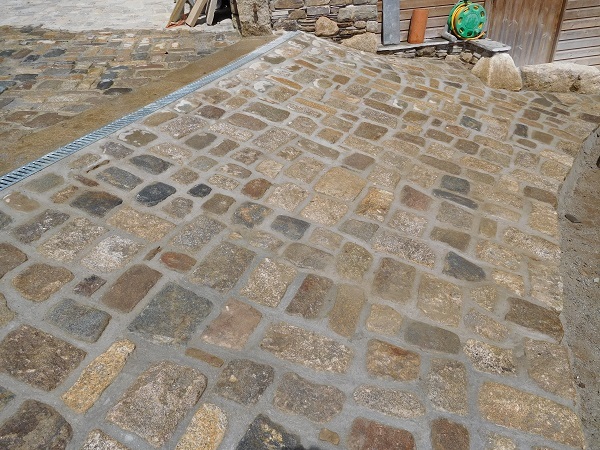 It also reveals the varied colours of the granite setts. 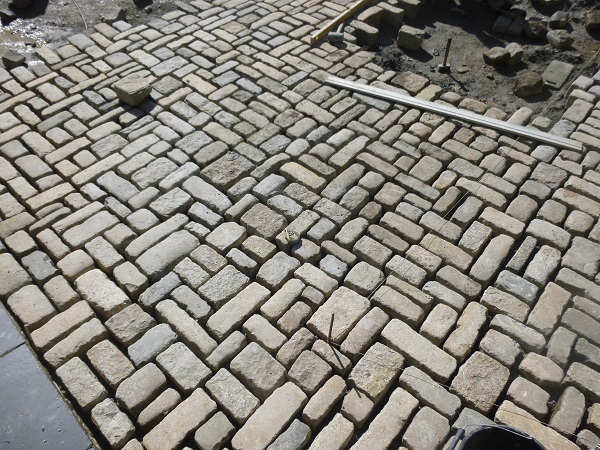 By now we had gone through the first delivery of setts. 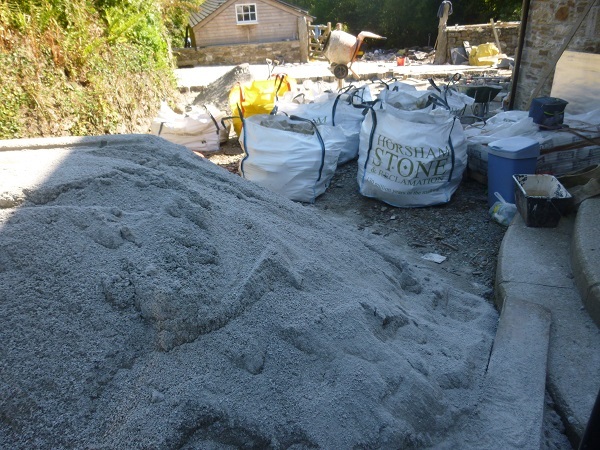 So another delivery arrived along with a few more tons of sand and at this stage we had only completed less than a tenth of the work. 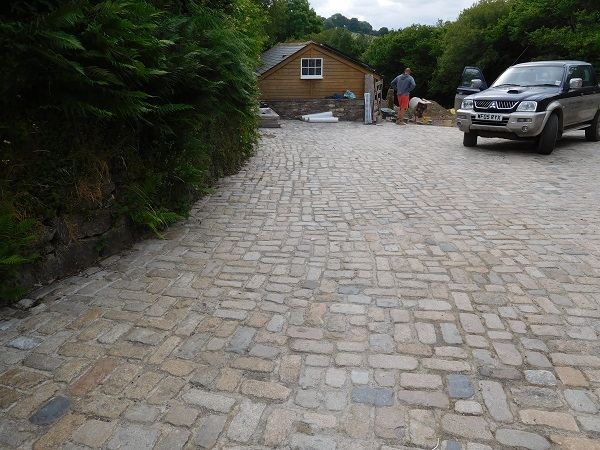 This enabled us to carry on up the driveway, and then another delivery of setts arrived again. There were a couple of manhole openings we had to sort out. 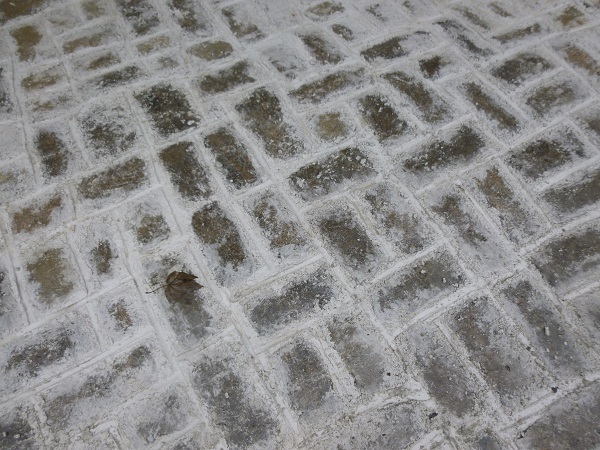 One was the original heavy duty cast iron type, and was still in vey good condition, so we used it again. 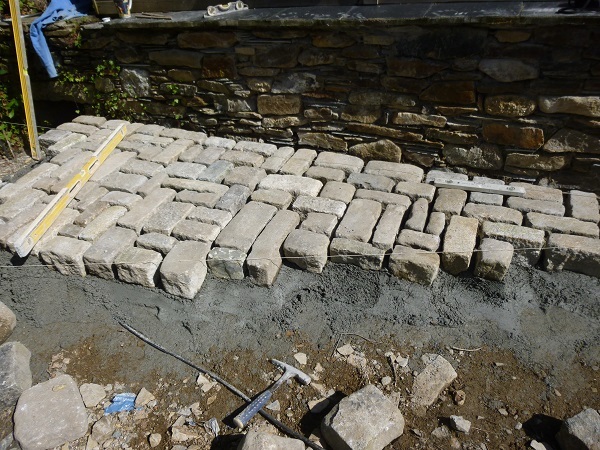 On the other we used a recessed cover which could be inlaid with the granite setts we were using and these are more discreet looking. 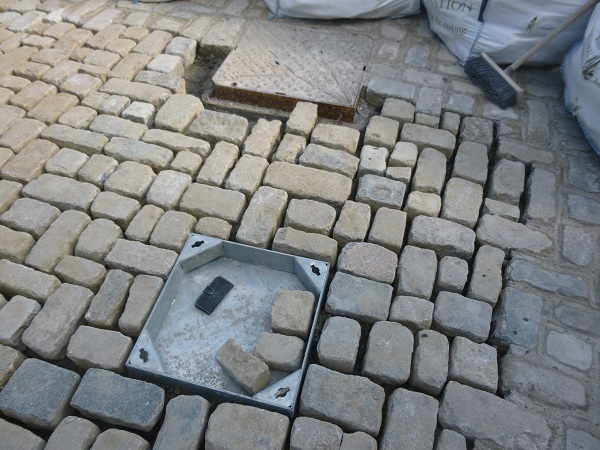 When these drain covers were set in we proceeded on up the driveway further still and by now we weren’t even halfway through the job. 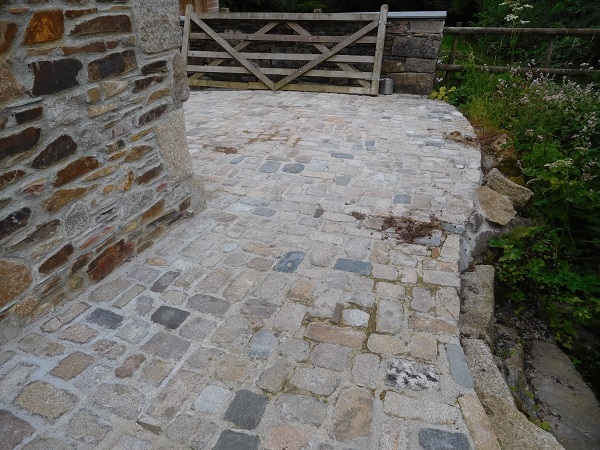 Eventually we reached the top of the driveway where we met up with an apron of granite setts that we had put in a few years ago when we converted the barn into a holiday let. 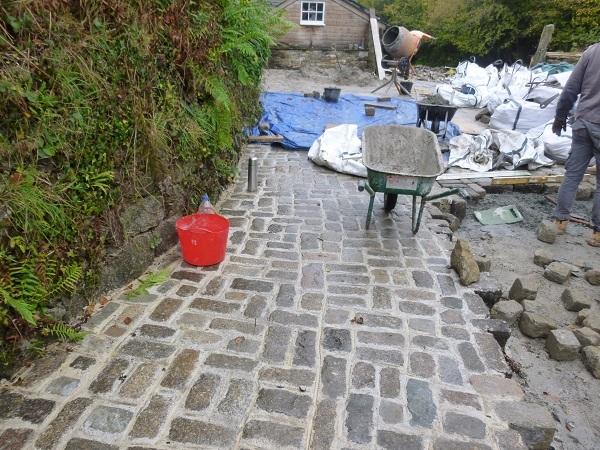 The last section to be finished at the top of the driveway went around the curved steps we had built previously for the new extension. 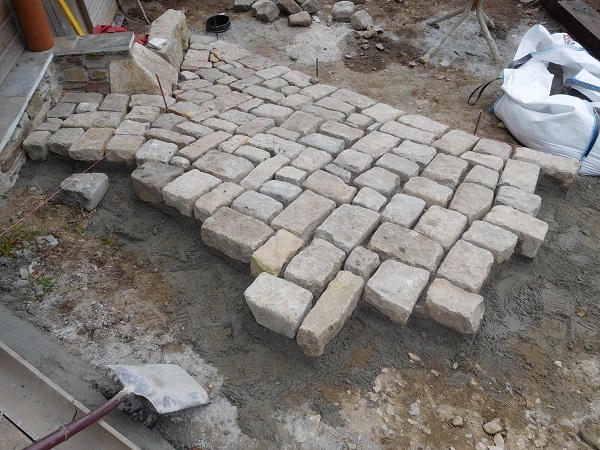 This section was laid in and then jointed up. 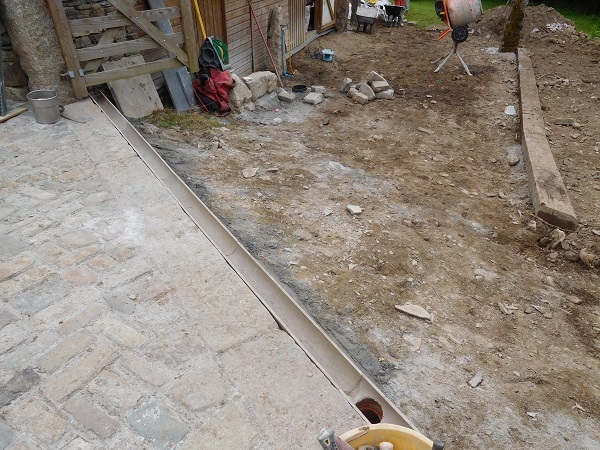 We were now roughly half way through the work, but we still had to go around the corner and up the other side of the building. 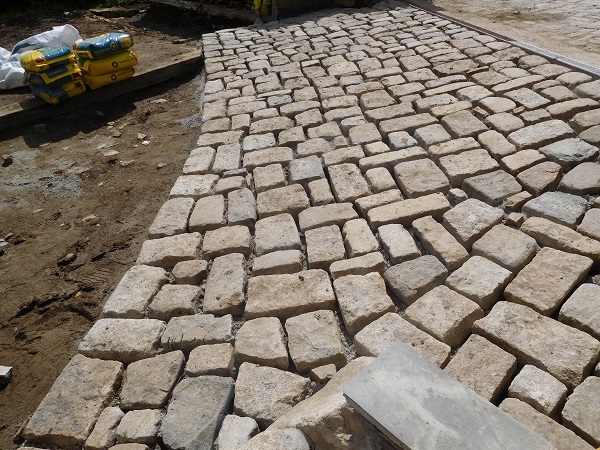 More setts were delivered. 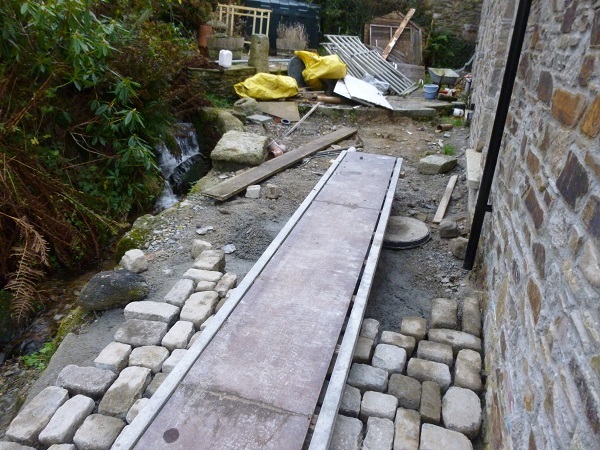 The last setts to lay were between the new extension and the stream that ran along side it. 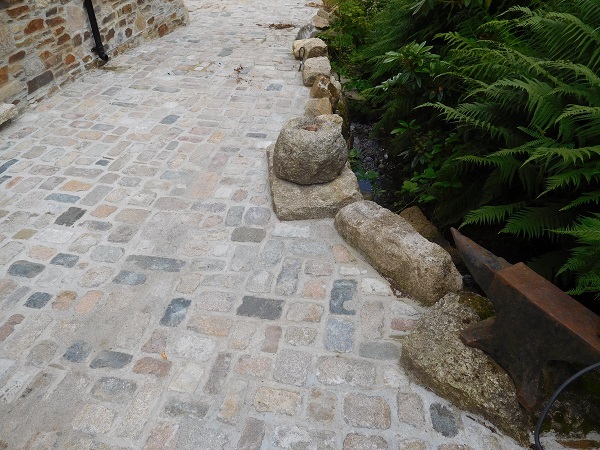 Part of the walls alongside the stream had to be built up to retain the path here and some large granite stones were set in as an edge for us to lay our setts up against. 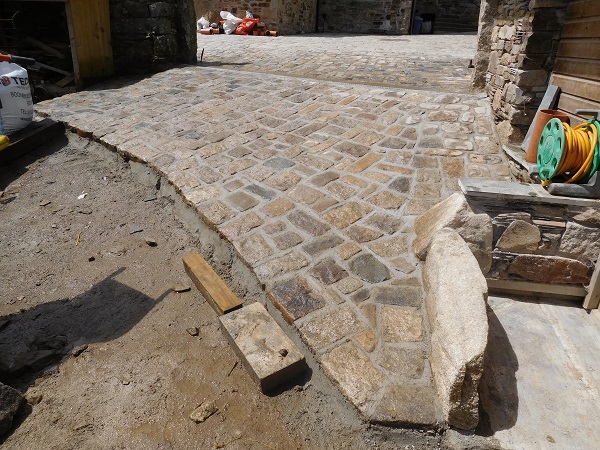 We also had to alter the granite kerb which stepped up to the sandstone patio. This was done to accommodate a door opening to the new extension. 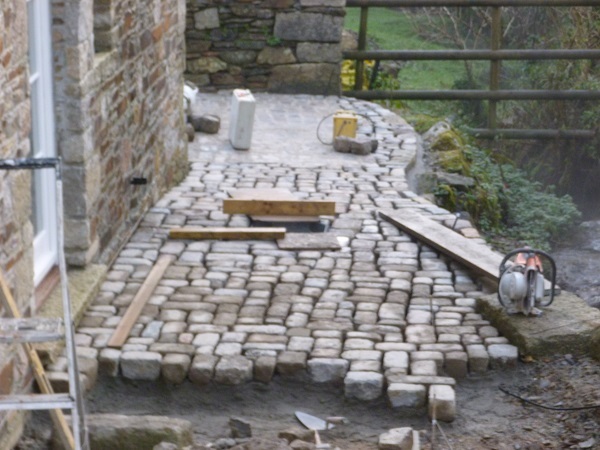 When we had completed all the setts around the building we had one final task to finish. 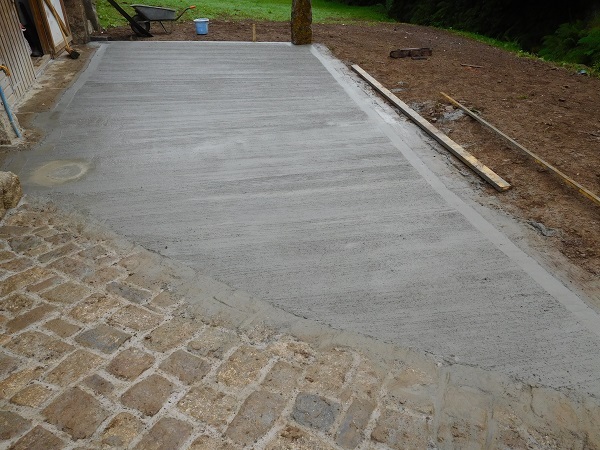 This was an apron into the field down to the workshop. 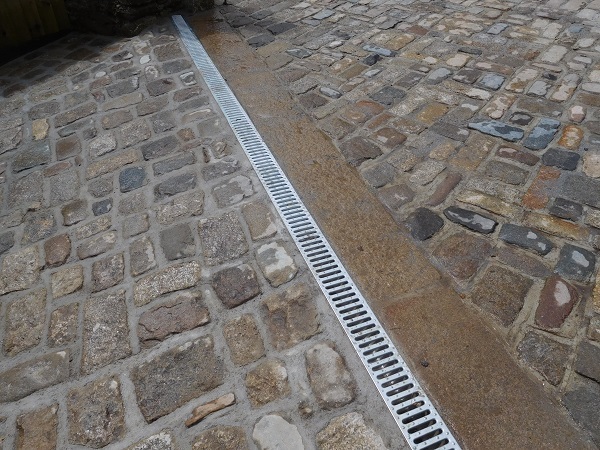 An ‘Aco’ grated drainage system was set in alongside the granite kerb line we had placed across the field entrance. Torrential rain had caused havoc to the field in the past. 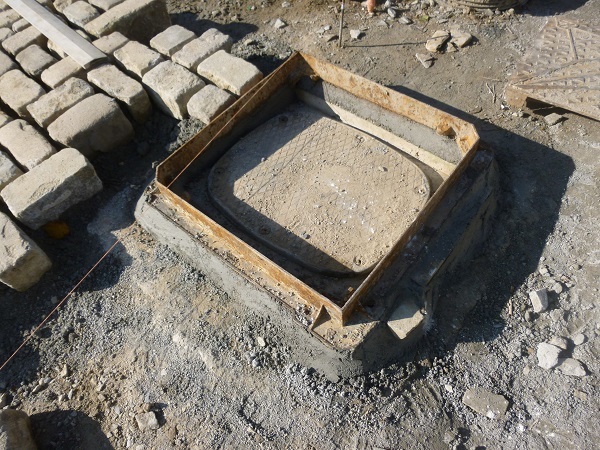 This drainage system would now help divert rainwater into a soakaway protecting the field. 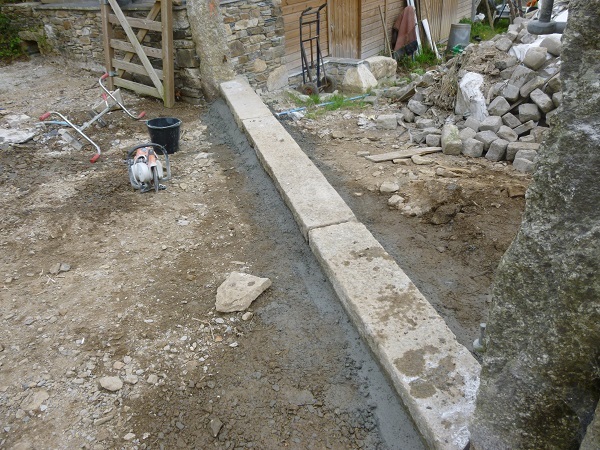 We also set in some oak railway sleepers to form an edge to the field. 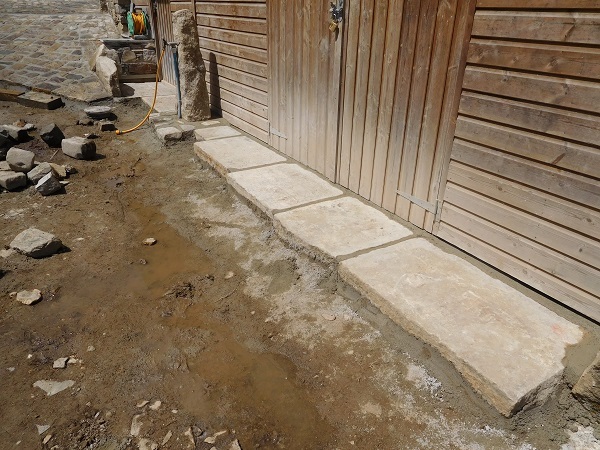 The edge of the apron was set out from one of the doorways leading into the workshop. 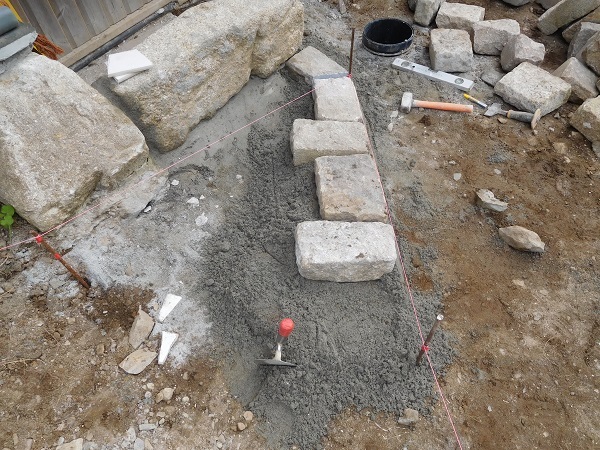 And then the setts were laid in up to the ‘Aco’ system. 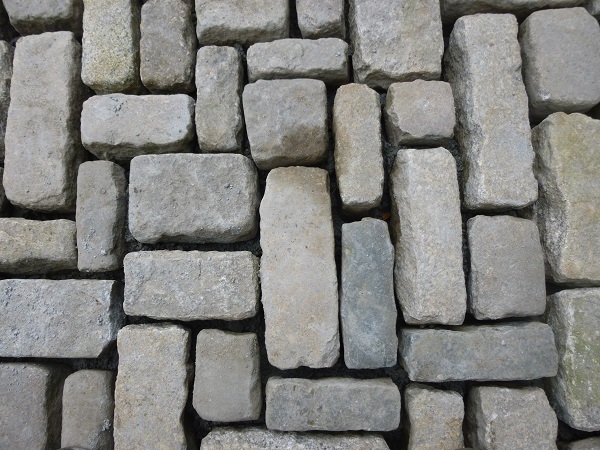 When these where in place they were jointed up. 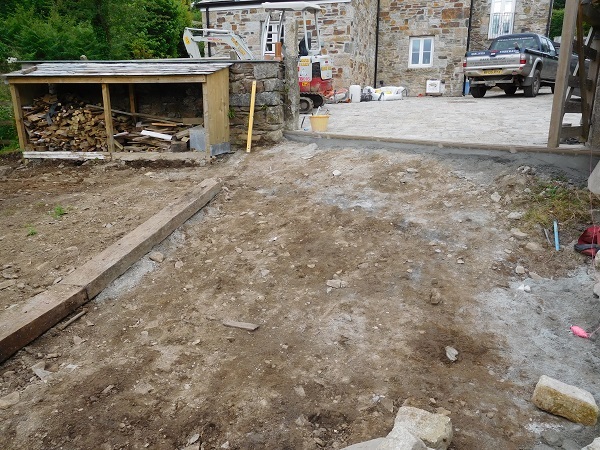 Some big slabs of reclaimed granite were set in up against the edge of the workshop. 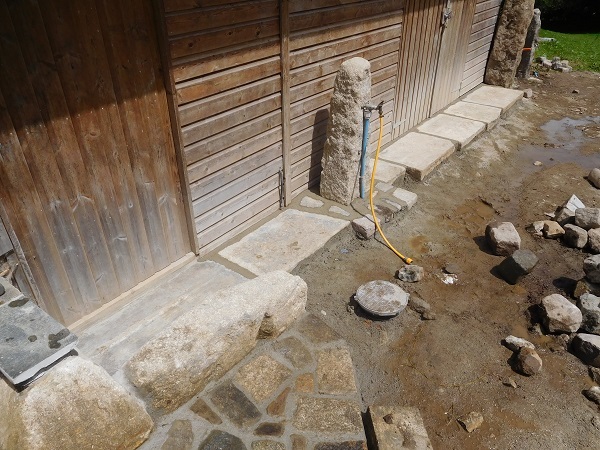 Along with a granite post to fix a water tap to. 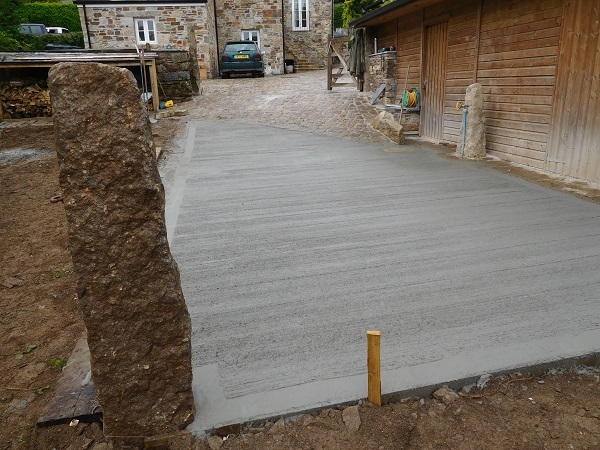 Another granite post was set in at the end of the workshop to eventually hang another gate on and concrete was laid down to form a hardstanding in front of the workshop. 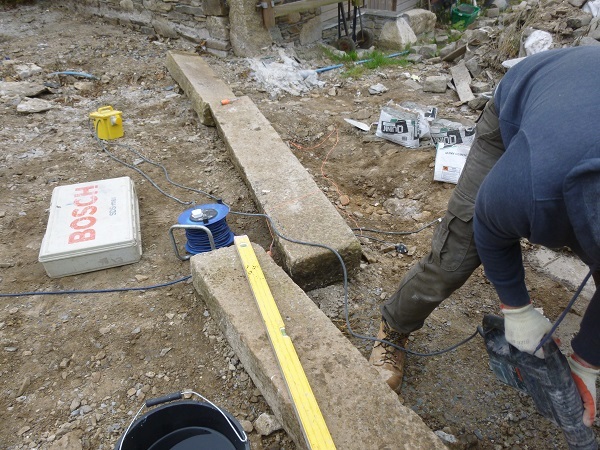 A wooden fence would also be constructed from the granite post along the line of the railway sleepers and would then separate this area from the field. 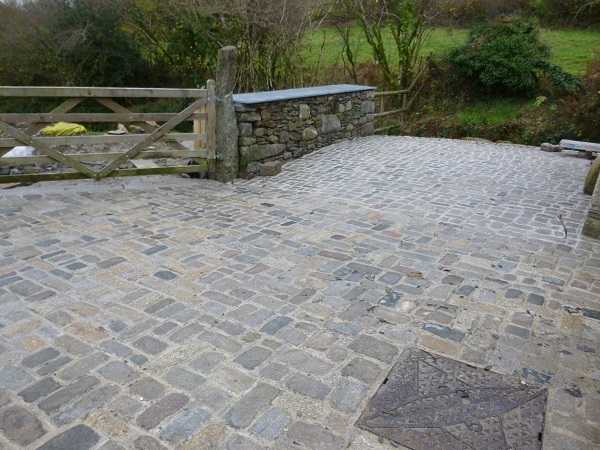 In total we laid down more than 10,000 setts for this project. Expensive? … yes… but in the long term they are going to be there for a very long time! 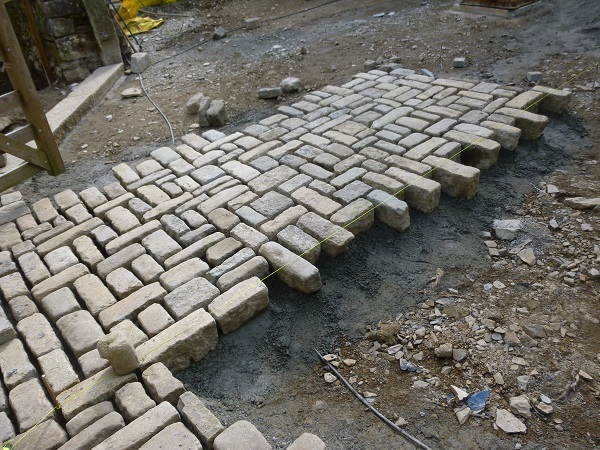 A sett is generally a rectangular quarried stone used for paving roads. 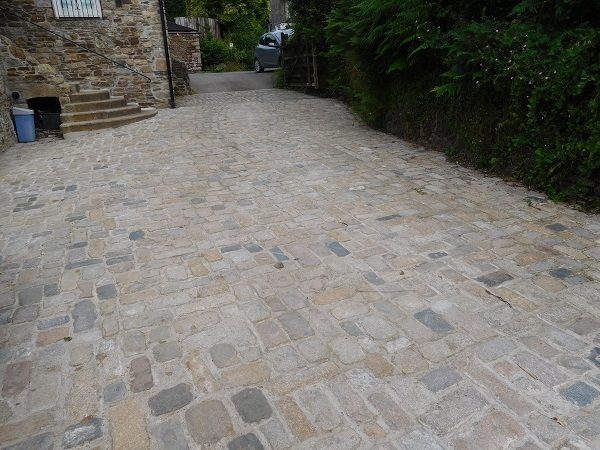 Historically they were used extensively particularly on steeper streets as the setts provided a much better grip for horses’ hooves than a smooth surface. 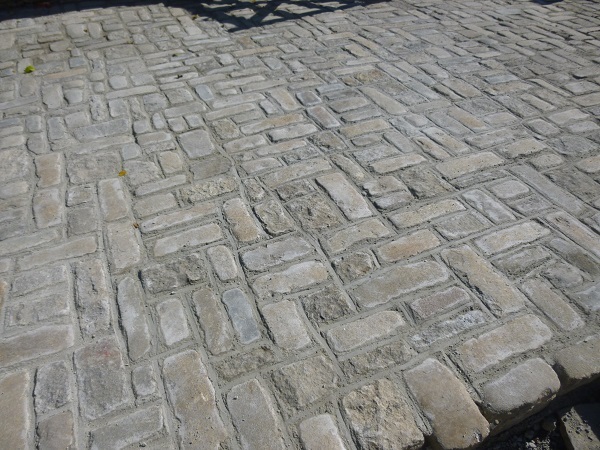 These days they are more likely to be used as a decorative stone paving in landscape architecture. 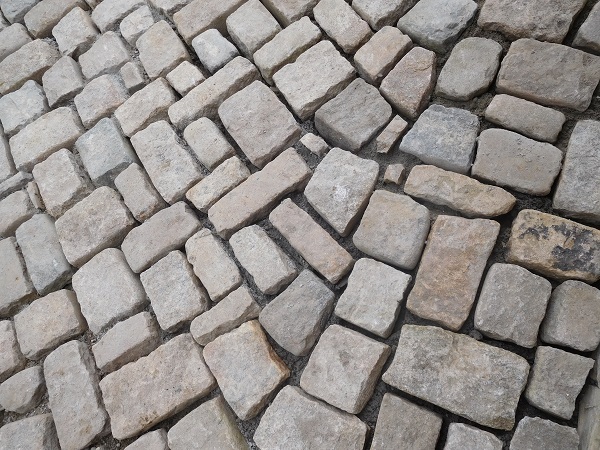 Setts are often mistakenly referred to as ‘cobbles’. 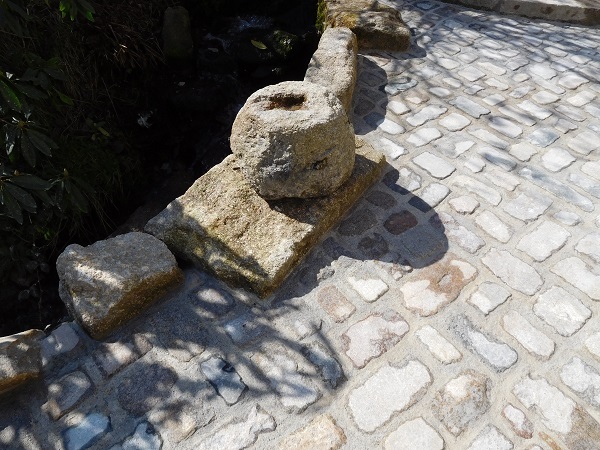 Whereas a sett is quarried or worked to a regular shape or size, a cobblestone is generally a small, naturally rounded rock, similar to a large pebble. 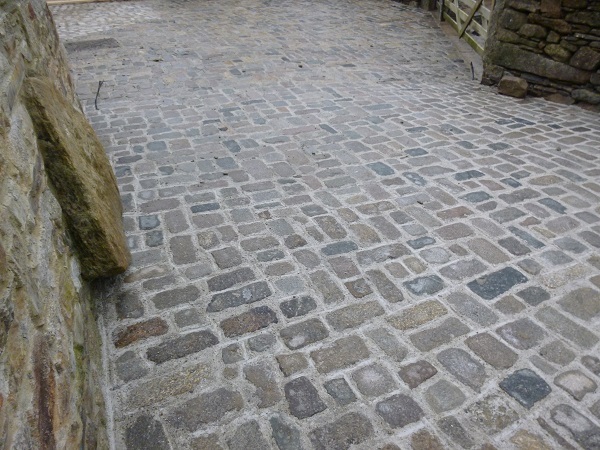 Setts are usually made from granite due its hard wearing properties.